Not every mall can be exciting, and truth be told, the Capital City Mall in Camp Hill, a suburb just southwest of Harrisburg, isn’t terribly remarkable. It’s a fairly standard mid-sized one-level mall with 576,000 square feet and three anchor stores organized roughly in the classic dumbell fashion. Its greatest drama seems to be that it was partially responsible for killing off another similarly-sized mall–the Camp Hill Mall–just to its north. But even that was due more to Camp Hill’s loss of Montgomery Ward than anything Capital City had a direct hand in. That said, I wanted to throw this one up because I have some (well, okay, one) picture from before the mall’s recent renovation and also a set taken a few weeks ago, after said renovation. Fast forward to today, and this corridor has been walled-up and turned into a fairly straightforward side hallway with stores along the edges, including a shiny new Hollister. That means that much of the original “open” area of the former food court is now occupied by store slots and there’s very little evidence that the food court was ever there. 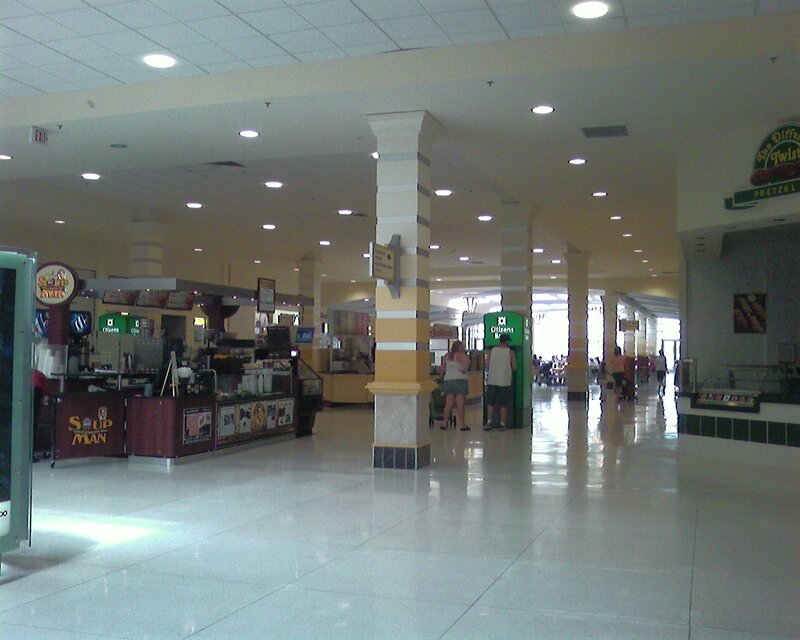 The food court itself moved towards the western end of the mall, not far from Sears, and occupies a space formerly taken by a movie theatre and several smaller stores along the side of the mall. Beyond some minor cosmetic upgrades, the renovation didn’t do much else (and as you may notice, the floors haven’t been redone at all). 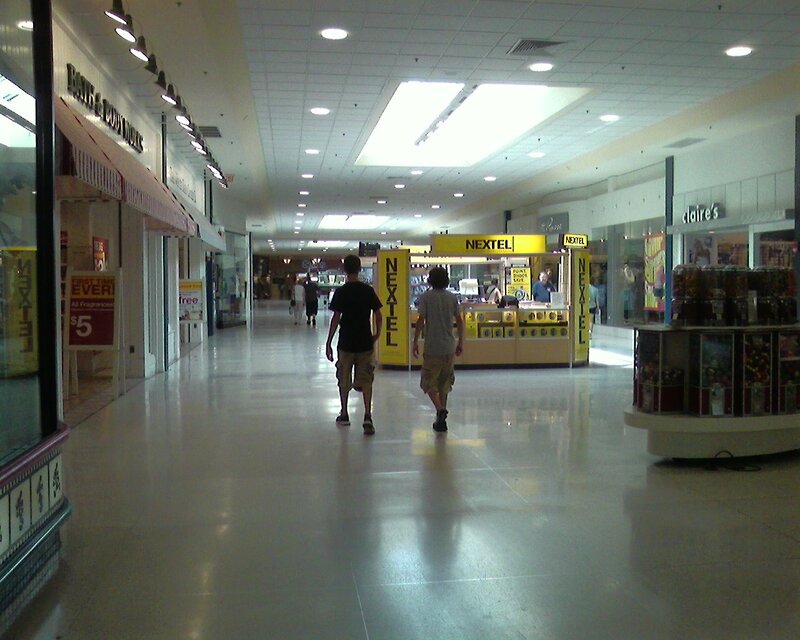 Until 2004, all of the Harrisburg area malls were pretty dated. This renovation was almost certainly necessary for PREIT to keep this mall in line with the much more comprehensive renovation completed in 2004 of the larger Harrisburg Mall, which is located only a few miles down the highway. Look for Harrisburg’s other shopping malls: Harrisburg Mall (formerly Harrisburg East Mall), Colonial Park Mall, and (hopefully) Camp Hill Mall soon. I may need the help of some good Labelscar readers at filling in the blanks on Camp Hill, since it was disenclosed before I ever visited and I don’t have any good pictures to share. If you have something you’d like to contribute, please let me know! 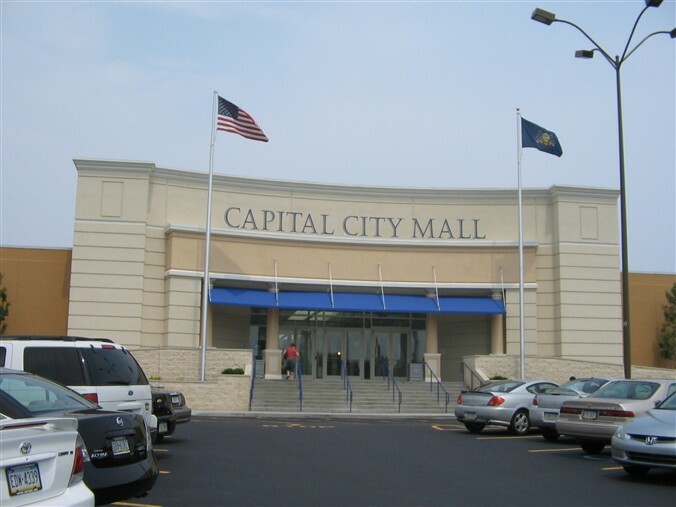 Check out the comprehensive PREIT leasing page on the Capital City Mall (which has a site plan and aerial photos and other neat stuff, as well as the official site. Want a little bit of mall history? Capital City opened in 1974 with Sears, Bowman’s and G.C. Murphy as anchors. In 1979, Hess’s repleced Bowman’s. G.C. Murphy was replaced by Ames seven years later, as the mall was being renovated and the food court added. 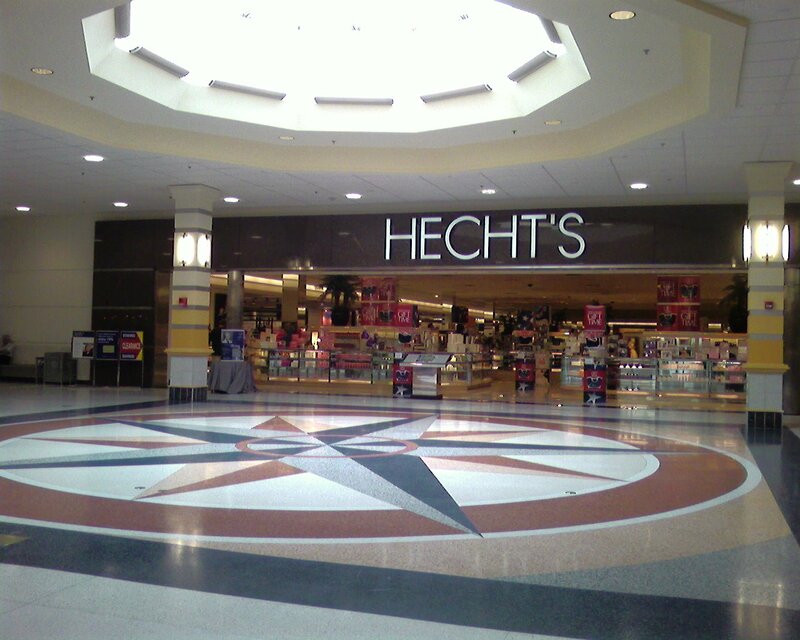 In 1995, Hess’s closed and Hecht’s took over its space. Ames closed that same year and was replaced by JCPenney (which may or may not have contributed to the JCPenney closure at Harrisburg East Mall a few years afterward). In 1997, the mall was renovated again and Sears expanded in 1999. I can help provide some insight on it…..The food court (in its original spot) wasn’t added until 1985…The mall would end right before the entrance to the old food court. Before the food court, there were some restaurants in the mall, such as Amity House (a restaurant once owned by Weis..none of them exist anymore), York Steak House, Roy Rogers, and a hot dog place that I can’t remember the name of. The long hallway that houses bathrooms and L.A. Nails once housed the arcade, which was called “Supercade”. 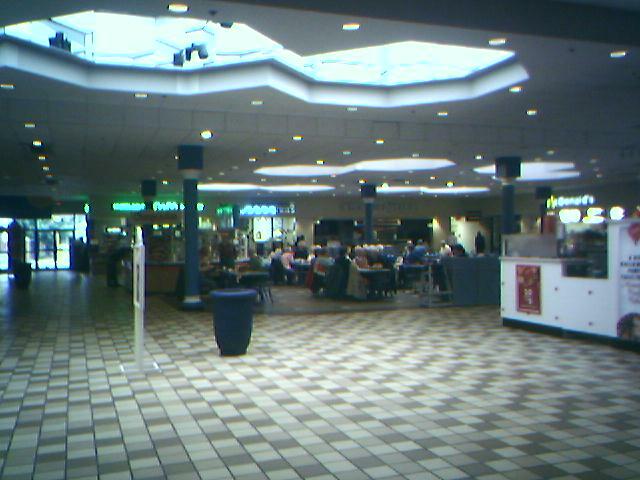 The next arcade to be in the mall was a CyberStation in the food court, but in 1997 it was replaced by an eyeglass store. I spent most of my adolescence in this mall. Haven’t been back easily in close to 20 years — pictures of it in this post look so antiseptic and horribly generic. My late 70s/early 80s memories of it are defined by images of dark wood “rustic” decor which feels, in my nostalgic reveries, cozy rather than claustrophobic. Does anyone know at what point they tore down the cineplex that was attached to the mall? I want to say it was a six-plex. Yea. I also spent every second I could at this mall from 75-95. I remember everything about it. It is so distant from its original shell. There was a pizza shop right at the edge of where the food court was built(cant remember the name). I used to play the jukebox on the left hand side and it had the best 80’s pizza! The Supercade was my home away from home. I actually worked there in 1989. Used to use all of the red coated quarters they gave us for bum games, playing games myself. There was a Friendly’s mid mall that closed when the mall forced all of the restaurants to move to the food court. The York Steak House was one of the first buffet style restaurants I ever remember. Their Honey glazed chicken was incredible. I can still taste it to this day. The decor of the mall was awesome and i truly miss it. There was a record store in in the corner where the jewelry store is now. I can remember Brett & Crew signing autographs there in 84 or 85. Lets see, what else? Murphy Mart was a great store, I remember buying(or having my grandma buy for me) Atari 2600 games there that were stacked in the bins up front for cheap prices. I also remember Off The Wall and a few other stores that were there. Radio Shack was not far from the arcade, it was replaced by Electronics Boutique in November of 88, I worked there from it’s open until 92. The manager and I are still friends today. Spencers had been there for the malls entire existence up until just 4 or 5 years ago, when it went out of business. Sears and Radioshack are the only two original stores that are left, I believe. Toys R Us came along around 85 or 86. There was a drug store near where Old Navy is now, though I cant remember its name. Rocky Horror was a huge part of being at that mall for me in 1989. Great movie theater in the back, that isnt there anymore that I watched many movies in and enjoyed my first real kiss outside of. Many memories. God, I miss the 70’s and 80’s. What a great time to grow up in and around Camp Hill, PA.
@B, do you know if there’s a walgreens inside, or a Wal-mart ??? and , what is the address there ( at the mall ??? go to http://www.myspace.com/myownworld for my artist page and private message me. I would imagine that in 1990, you worked under Jackie(she was the manager there then). She later moved to Florida and was a manager at EB there. I lost track of her after that. Anyways, message me on myspace and lets catch up. I all but grew up at this mall and haven’t been back since the late 80’s so THAT is the mall that I still is my memory. That means the mall WITHOUT the food court. Steph, the cineplex still existed in the early 90’s because a few friends of mine were in a Rocky Horror cast at that theater. Whoa! Lose the attitude. You’re probably 16 and have no idea what nostalgia means. Go elsewhere to complain. I moved to the area when I was a child in 1995, so I essentially grew up with both the Capitol City Mall and the Camp Hill mall. I remember that I used to go more to the Camp Hill Mall, because it actually seemed nicer and had a Yummy Gummi Zoo (Candy and Stuffed Animal Store). I should send you some pictures that I have of the interior of the Camp Hill Mall, or at least the hallway that hasn’t been walled up. The movie “Mannequin” from 1987 was actually filmed at the Boscov’s in the Camp Hill Mall. In terms of Capitol City however, the pictures that are currently posted do not do it justice. It really has been improved quite a bit from how it looked before the renovation. Now it has a lighter and airier feel and has pulled in major stores like Build a Bear Workshop, Wet Seal, and Forever 21 that it did not have before. The overall decor of the mall is no longer dated and it doesn’t have a dark feel to it anymore. It is certainly a more upscale mall than it used to be, and nearly makes up for no longer having the Camp Hill mall anymore. For a little history lesson, the Camp Hill Mall also used to have a Benetton, Unitz, and Camelot Records in it at it’s prime. It’s a shame that it’s no longer the beautiful interior mall with the fountains and brown terra-cotta decor that it used to be. However, if you enter through Boscovs’, you can still walk into a hallway with a few tenants in it and see the old decor and a teal “Mall” sign in it. Thanks to Todd for clarification on the Capitol City cineplex. And as for Camp Hill Mall — unless you came of age in the mid-1970s you probably wouldn’t remember the ORIGINAL Camp Hill Mall — when it was the Camp Hill Shopping Center, open-air, anchored by a Korvette’s (which then became Boscovs). There wasn’t much else there at that time — an independently owned drugstore with a bona fide, old-timey lunch counter (I’d ride my bike there for chocolate milkshakes and grilled cheese), a shoe store where they gave you pretzel rods (Florsheim’s? )…and the Camp Hill Twin, a freestanding two-plex movie theater a stone’s throw away in the parking lot. Dont forget the Bowling Alley in the back and the great arcade that was one of the last stores left before that mall closed. There was a flea market there for years before they tore it down and put up what we now know as the Camp Hill Mall. Even the Camp Hill Mall has undergone changes in its years of being built. There used to be an entire hallway before Boscovs. A record store, A candy shop, a hair salon, jewelry store and pet shop were among the stores in that hallway. 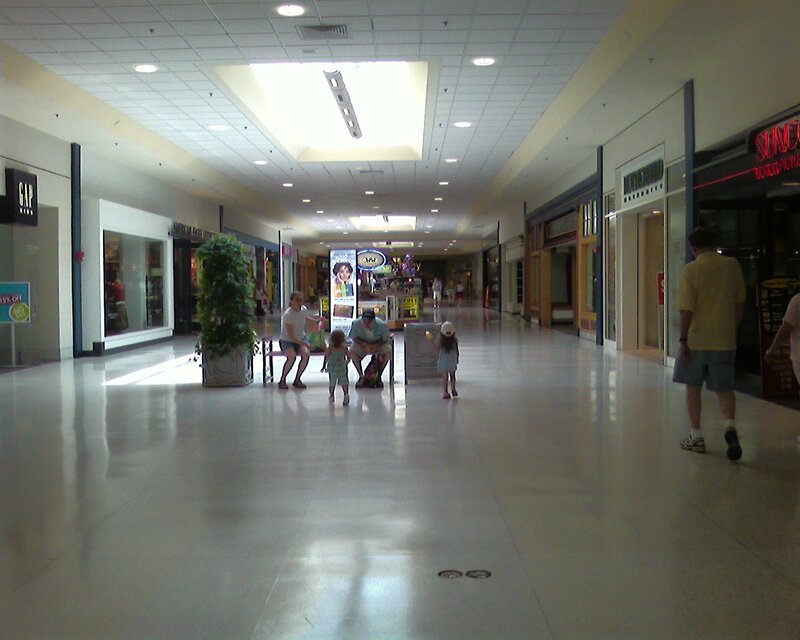 The movie Manequin was partially filmed in Boscovs right before the Camp Hill Mall opened. If you watch one of the first scenes from the movie when Andrew Mccarthy picks up his love interest outside of the store, you can see the B from the Boscovs logo to the far right. Their are many interior shots that you will also recognize. Remember the Record shop they had in the original Boscovs? How about the stereo shop right behind that? The auto parts shop to the back of the store? My entire existence was based around the Camp Hill and Capitol City malls from 75-95. Oh I remember those days. They had a Howard Johnsons restaurant where a PNC bank is now. Wow…Korvette’s…been a long time hearing that name. We lived in Chambersburg in the late 6-‘s and would drive up to the Korvette Store, and then at the Howard Johnson’s restaurant. Very vaguely as being a guy I never went in there, but I do remember that roof outside of it, it was directly across from Wee Three Records right? @Kathy, mystery solved after all these years…Stanyon Street was name of that store! I remember a lot about Capital City Mall from the 80/90’s. I wish there were old pics of it. I remember Murphy Mart, then Ames where JC Penney is; the York Steak House, Roy Rogers, Friendly’s, the old food court, Papa Dino’s pizza, they even had Baskin Robbins in there too. Ormond’s was a woman’s clothing store near Sears, People’s Drug was where Old Navy is now and the DEB/JOY shop was also up there as well and then Fashion Bug for a time. There was EnKay Sports, KB Toys, Bavarian Pretzel, Thom McAnn shoe store, CCNB Bank and Harris Savings, Waldenbooks, Wee Three Records and there was a kitchen store too. Wasn’t there a fountain in the middle of the mall by Hess’s? United Artists Theatre was there ( i worked there in the 90’s). It had those ugly pink and green colors that everyone said made it look like a movie theatre in Florida and the big block entrance outside that said “1 2 3 CINEMA 4 5 6”. There were stores that appeared in the 90’s and then disappeared quickly like The MerrygoRound; some Earth store; a store that sold china called “The Mole Hole”; Afterthoughts (which rivaled Claire’s), Lane Bryant and there was a store in the 80’s called Anderson’s that sold men’s suits & tuxedos too. Don’t ask me how I remember all this. As for the Camp Hill Mall, i remember when it was enclosed for a period of time, Montgomery Ward was on the end, Yummy Gummy Zoo, Wildware, Life Uniforms and Shenk & Tittel were inside and Pathmark was behind it, I remember the Camp Hill Twin and the bowling alley too. Again, don’t ask me how I remember all this. I used to work at the Cap City Mall theater, and like alot of you, spent the majority of my youth and “tween” then later, teen years at that mall. I was away from it for a while, other than necessity shopping and occasional movies, but then my early to mid 20’s brought me back as an official mall rat. I have SO many memories of that place. The record store was originally called The Listening Booth, and was on the corner where Journey’s shoe store is now. Then it moved to the corner on the end of the main entrance near the old food court and was called Wall to Wall. Then was called The Wall. Wee Three Records was at the end of the mall to the entrace of Sears, and is where the Pearl Vision store is now. I remember the water fountain in the middle of the mall in front of where Macy’s is now. That’s where you originally came in the front of the mall before they added the original food court. The decor of the theater is what I remember most. The dark brown wood textured paneling and the brown and beige floors. As was said earlier, it ( and the whole mall ) had a cozy feel to it that was just wonderful. The Supercade also got alot of my dollars and my time. Then they put the legal contact high nail place in there. How they sit in there all day w/o passing out, I don’t know. So many other memories, and things that have been touched on here already. I’ll have to think more and get back to ya’ll on this! And btw, the theater was haunted. I’ve had SO many things happen to me when closing that place, it’s unreal. We ( theater employees ) were never sure if it was the patron who died the first year of the theater in house 1, or if it was the old man who’s land the mall was built on, that was deviously swept out from under his families feet after he died. Either way, some WEIRD stuff went on in there. I worked at that theater in the early 80’s, I remember recording the show times on the machine in the office. You’re right, it was a creepy place after close. We all stayed late one night to watch Halloween, to this day I swear that something moved by the steps next to the screen. Going through the back hallway to make the night deposit after the mall had closed was also creepy. 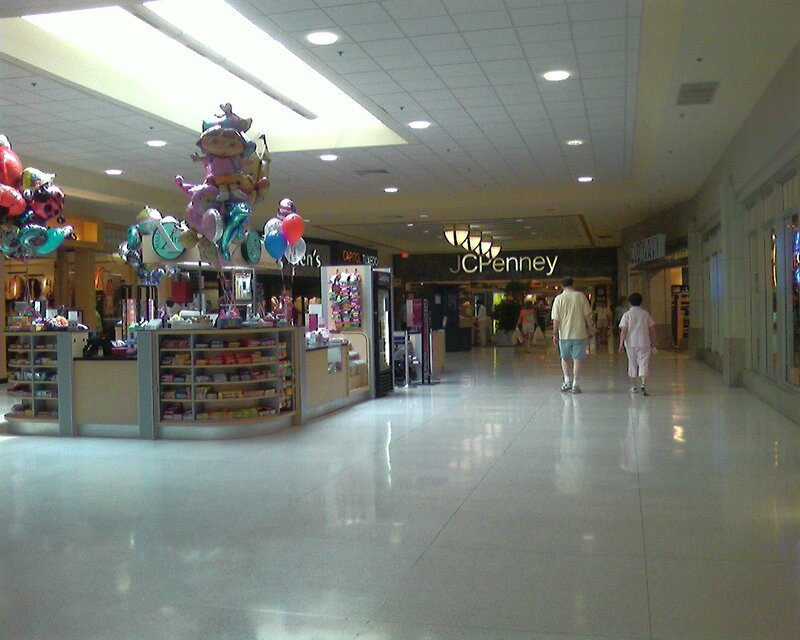 Oh and where are these old mall pictures everyone is talking about? There’s only new remodeled mall pics up above. I am glad to see someone filled me in on the stores that I had forgotten about, namely the drugstore that was near the York Steak house. There was a piano place in between them. I used to bug the hell out of the one guy who worked there by coming in and playing the keyboards all of time. I had also forgotten about the Roy Rogers, which my grandmother would take me to for roast beef. I remember always loading up my plate with a ton of pickles from the fixins bar. Man, great times I really miss. @B. Rader, I too,remember all those things about the Capital City Mall.That really takes me back! I really remember the music store because I got lessons for like a year. My nana always took me and my brother to York and tipper the server right in front of the “No Tipping” sign! Oh, and there were fountains up and down the mall. A huge one with a bridge outside of the York Steak House. I always think about that fountain when I visit the mall. It just looks so horrible. Anyone remember the Colonial Park Mall with the sunken in floors? The arcade in the basement of the East Mall? @Jill, what was the name of the record store, site and sound? they sold posters ,bongs and weird stuff, not just records. i think the all was closed in but it had carpet and dips that would make people trip and fall. Lived about 2 blocks from the CHMall for 30 + years. Drug store was People’s, and the shoe store that gave pretzels was Irving’s and it is still there as Irving’s Shoe Fly and yes they still give pretzels. The theater was the Camp Hill Theater I believe, one screen, and it stood apart from the mall, as did a car wash both of which were torn down for Mongomery Ward Auto service, which was torn down for PA. Orthopedic Group. The original mall was open air, with E.J. Korvette’s at one end, and People’s at the other. Korvette’s had the BEST VINYL at the best price in the area, and was always busy. It went down hill and was closed, the mall was covered over, and then remodeled into the best of 70’s, which was then remodeled into the best of the 90’s. It’s still ugly. Now it as a HUGE Giant grocery as an anchor store, and the traffic pattern is terrible. I avoid going there except as a last resort. Once met a guy who said he used to HUNT the corn field that used to be there in the 1960’s with his hunting dog. Recently a BLACK BEAR was trapped just at the edge of the Boscov’s southenmost parking lot. Might soon be time to let hunters in there again. Peoples Drug store, they made the best burgers at the little lunch counter in the back. And don’t forget Funderland. Does anyone remember the restaurant that used to be inside the sears store? I vaguely remember one being there in the late 70’s early 80’s. my sister had a crush on a kid who worked there who wore a suit and liked doing magic tricks.